Diameter: 8.5 mm (~5/16″) O.D. – 5.5 mm (~7/16″) I.D. 1. 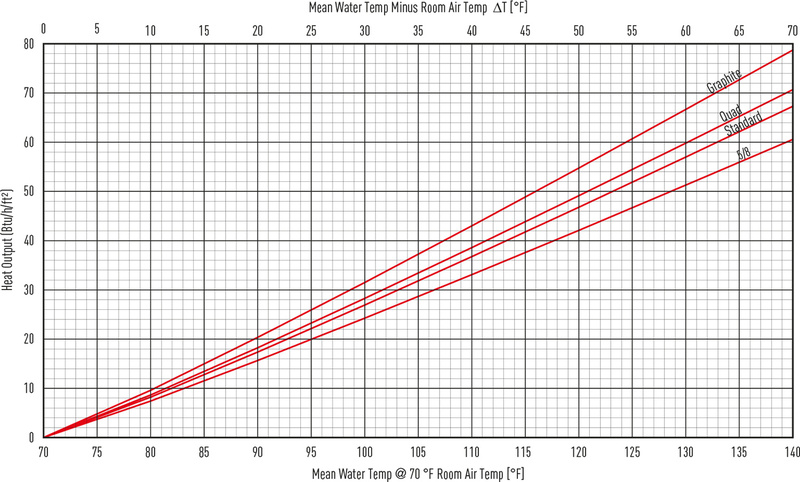 Typical 100°F (max 140°F) mean water temperature @ 70°F room air temperature. Tested in accordance with EN 14037. 2. 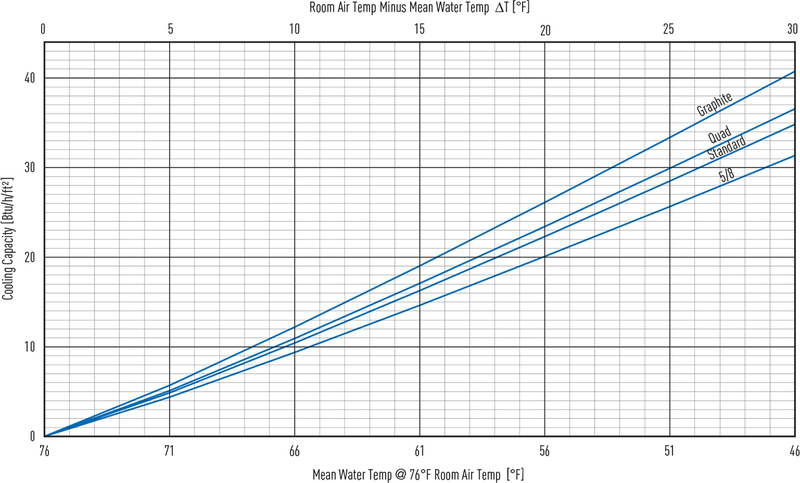 Typical 56°F (min 46°F) mean water temperature @ 76°F room air temperature. Tested in accordance with EN 14240. 3. Data certified by third-party laboratory. 4. Only available in european format. The diagram shows an example of 8 Ray Magic panels connected in series by a supply and return leaders. At the nominal flow rate of 0.22 GPM per panel, each internal circuit (8mm – 5/16” O.D. serpentine tube) has a flow rate of 0.11 GPM and a pressure drop of 1.59 ft constant. As the fluid travels through the series of panels (supply and return backbone lines) the head loss gradually decreased as the flow decreases since all the panel internal circuits are in parallel. In essence, the backbone lines act as an internal manifold and maintain all the circuits in balance. At the opposite end of the leader connections, snap-in end caps are installed (NO reverse return required). 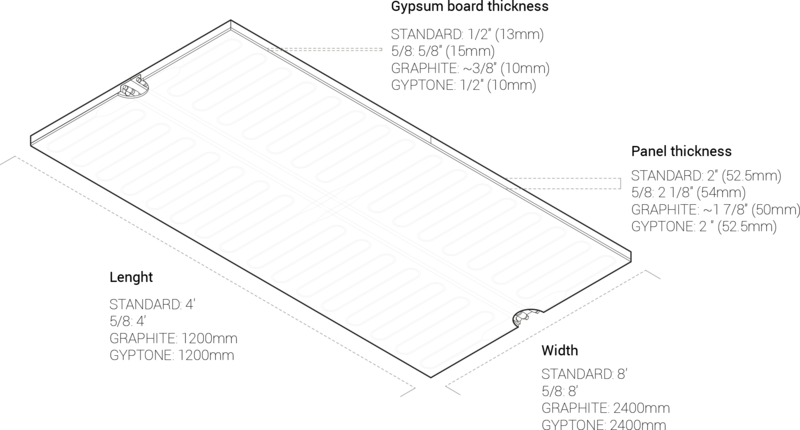 The panel backbones have a head loss that, depending on the number of panels, can vary from a minimum of 0.01 ft with only one panel to a maximum of 1.65 ft with 8 panels in series. The fact that the panel circuits are in parallel, and maintain a constant pressure drop that is always greater than that of the main supply and return leaders, ensures an excellent hydronic self-balancing and an optimum thermal distribution over the series of panels. This makes balancing of the manifold loops unnecessary and commissioning a breeze.